Traded in my 1997 F150 for my 2007 F150. I love everything about it except. 1. Paint chips real easy. 2. Rear fender wells needed to be covered with something besides paint. 3. Heater on full blast is loud. 4. Lots of wind noise with the window down, compared to my 1997 model. 5. Plastic interior scratches when you look at it. Other then those I love. Here is my old truck and new truck. Hey, all you guys that reported the motor ticking sound, me too! Talked to the dealer about it - this is characteristic of a Variable Cam Timing engine at idle. The 4.6L got VCT for 2007, just like the 5.4L. It's a big part of the 17HP boost from last year. Better yet, VCT allows that HP to applied across a much broader RPM range. It's another reason Ford engines have such great torque even at low RPM's. Don't worry about the tick - you can still out-pull a Chevy, but by even more this time! my wife and I just bought one. and added a flowmaster and dual pipes. we like the sound and also the ride we added the 2.5 leveling kit and 33-12-50's it really looks and drives nice. But we do notice a hesatation in the pedal not shure what it is. I thought it might be the timing in the trans. but not shure. other that that . it seems to be a good truck. there is one thing my wife does not like the speed limiter. I finally had a decent day to take some pics. Searched every dealer in Northern Cal to find the one I wanted. 2007 f150 fx4 black with black leather int. A few mods to come soon and then pics. Picked up this truck 4-23-07, my first Ford. Red Fire with Pueblo Gold accent. Coming next week - Leer 700 lid and Bedrug. 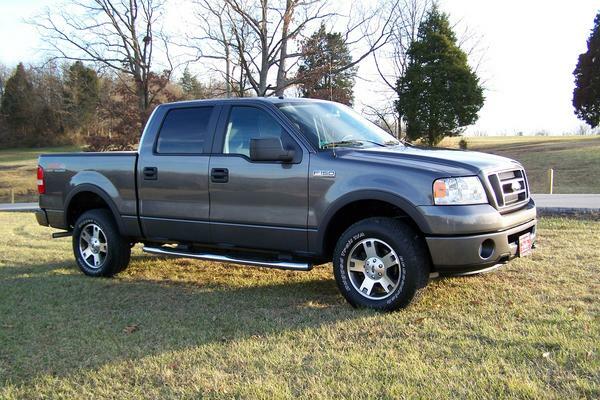 I had a 2006 STX but didnt like the 4.6 or the supercab so I bought the 2007 Screw XLT. I originally had a 2001 suprecrew Lariat. I traded that for a 2004 FX4 suprecrew. When we left Washington, I stupidly traded my FX4 for a dodge charger. Shortly after I realized, I still needed a truck, even though we did not have a large property. I traded the charger for a 2007 supercrew. I have not regretted it at all. Funny I just traded my charger in for fx4, I loved my charger but the need for a truck wins. My truck is an '07 SCREW KR 4x4 with a lot of the options. 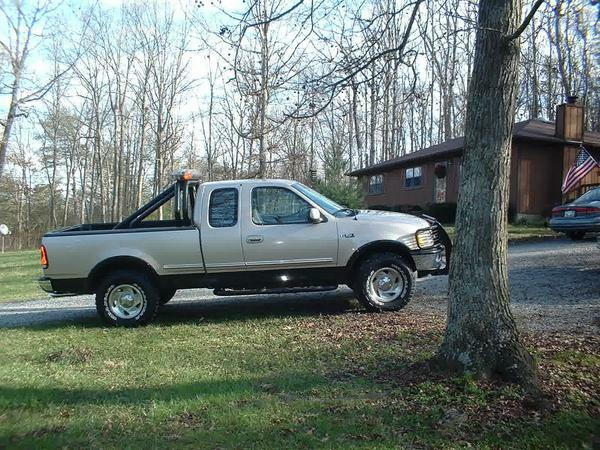 Previous truck was a 2005 SCREW Lariat. Went in for an oil change on the old truck, drove out in the new truck. What I like about the new truck is the painted door and tailgate handles, painted skullcap on the mirrors, real leather on the seats, heated front seats, better ride and lastly, the nice oem 20" wheels. Overall, the stance of the '07 KR got me hooked. I got to say I'm very impressed with the new truck. In over 6 months and 13k miles, the ride is oh so fine. It makes for one excellent highway cruiser. I never thought Ford could make such a fine vehicle! Has anyone installed the MOBILE-EASE SYSTEM IN YOUR TRUCK. If so how do you like it? Im thinking of buying one? Just got mine this past Monday. White FX4 4-door with black leather interior fully loaded. Plan to take pics this weekend. What are the most popular mods? Going to do the exhaust mod and put a bed liner this weekend.